Perhaps you have dreams of starting a new business for yourself. This is a good idea if you are tired of your current job and the low salary you are making. So what type of business should you get into? Selling food or merchandise in a public place is a good idea if you like working with the general public. You need to choose food items that are in demand in order to do this successfully. You will also need to decide if you will be selling your food from a cart or a kiosk. The location you choose will directly dictate the amount of sales you will be able to generate. Here is how to buy a food vending cart or a kiosk. 1. What company makes the cart or kiosk? The craftsmanship involved in the manufacturing of your food cart or kiosk will be very important. All food carts and kiosks are not created equal. In fact, the quality of these items can vary greatly between the various companies that produce them. This is why it will pay you huge dividends to take some time and shop around for it. Remember, this cart or kiosk is going to be your livelihood. Therefore, buying it is far too important a decision to simply rush into it. You need to make sure you buy one that is made by a company with an outstanding reputation in the industry. 2. What type of food or merchandise will you be selling? The food or merchandise you decide to sell will dictate the type of cart or kiosk you will need to buy. For example, there is a certain type of cart that is specially made for selling hot dogs. You have most likely seen these on many street corners in large cities. There are also carts that are uniquely designed to sell ice cream and non-food items like sunglasses and jewelry. These carts and kiosks are very different. Because of this, they will tend to vary greatly in price. 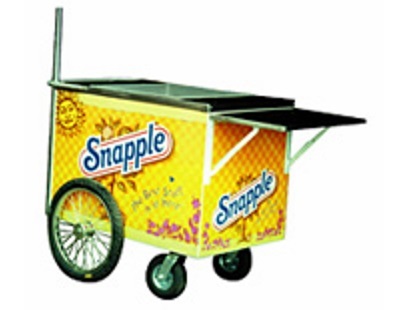 If you are interested in buying a beverage cart, you can go to http://www.allstarcarts.com/pushcarts.html. 3. How much space will you have? Space will not be an issue for food and merchandise carts because you will be able to move it to a convenient location. However, you must be certain the kiosk you buy fits into the space that the mall has allotted for you.